Joe Johnson in 1992 (left) and today (right). 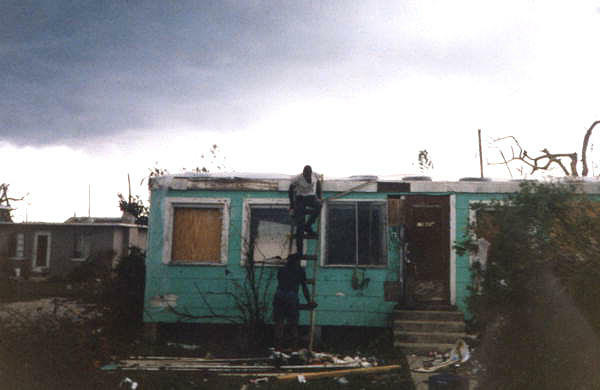 Men work on a home damaged by Hurricane Andrew. We first aired this piece five years ago, and we're bringing it back now to mark the 25th anniversary of Hurricane Andrew. A happy update: Joe Johnson, the DJ who created this piece just a few days after the storm, is now WLRN's morning host. Back in 1992, radio DJ Joe Johnson mixed "Riders on the Storm" by the Doors with the voices of people who survived the harrowing experience of Hurricane Andrew. You can find a lot more stories about Hurricane Andrew, 25 years later, here. We’re psyched to be able to share a piece of archival Hurricane Andrew ephemera from a familiar voice for some South Florida radio listeners. Joe Johnson has been a DJ at Majic 102.7 for the last 25 years. He hosts the nationally syndicated “Beatle Brunch” show. 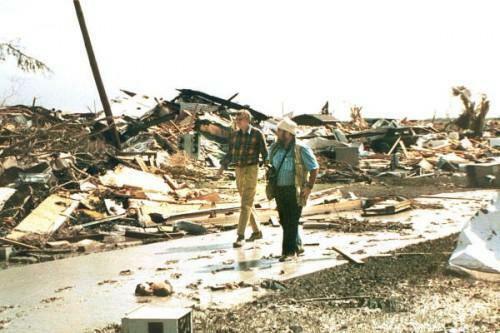 A couple of days after Hurricane Andrew hit, Johnson was on the air doing his part. He was feeling a little helpless, so he started, “looking for songs that would help paint the picture of what was going on down here. Songs like 'Lean on Me' or 'America' or 'Come Together'.” He finally decided “Riders on the Storm” by The Doors would be the perfect song to accompany an audio snapshot of life after Hurricane Andrew. Johnson’s piece originally aired on Magic 102.7 just days after Hurricane Andrew. He rediscovered it just in time for the 20th anniversary. Here, in full, is Joe Johnson’s original piece (listen on the player above). And you can listen to more pieces like Joe's or read more personal essays when you visit our “Remembering Andrew” Storify. 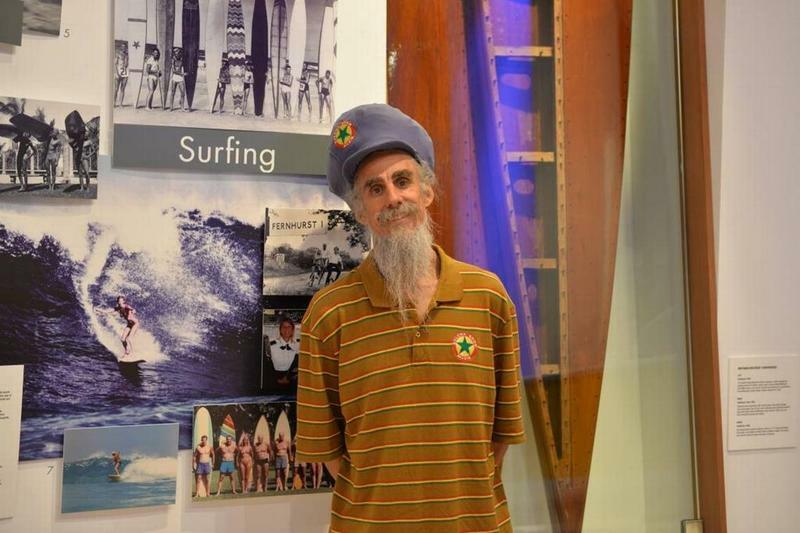 Last week, WLRN premiered part of its “Remembering Andrew” radio documentary Thursday to an audience at Miami Science Museum. Bryan Norcross was an invited guest. Norcross, of course, became famous for his ongoing coverage of and guidance during the storm. During a panel discussion following the airing of the first part of the special, Norcross talked about his memories of the people he talked to during the storm and the region’s struggles afterward. Lenny and Marcia Brod clearly remember one sleepless night 25 years ago. It was the eve of Hurricane Andrew. In 1992, they were raising their two kids in a new home located on 128th Street and Southwest 107th Avenue in Miami. They had barely planned for the Category 5 storm hurling toward South Florida. Growing up in Miami, Nanci Mitchell has been through a lot of hurricanes. But Hurricane Andrew was a different story. 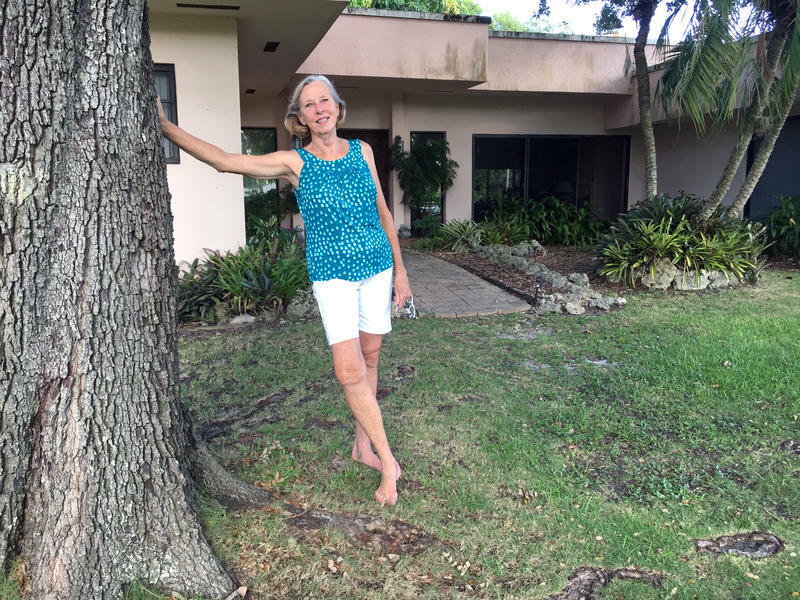 “There was nothing like this hurricane,” she said. 25 years ago when Hurricane Andrew hit Miami, Lance O’Brian and his friend decided to wait out the storm in Miami Beach. Both surfers, they hoped to catch some good waves once the storm had passed.